Today is Lag B’omer – the 33rd day in the counting of the Omer. Despite the general tone of mourning during the counting of the Omer, Lag B’omer is celebrated joyously – according to various sources as the end of divine plague that punished Rabbi Akiva’s many students; the anniversary of the death of the Rashbi (Rabbi Shimon bar Yochai, whose school is attributed as the author of famous Jewish mystical work, the Zohar); of being the “day of Splendor in the Week of Splendor” (Hod ShebeHod) reflecting a special day of revelation; of being the day that manna first fell on the Israelites in the desert; or other traditions. One of the more interesting traditions of Lag B’omer lies in its links with Bar Kokhba (or Ben Kosiba, as explained below), a candidate messiah (reportedly endorsed by Akiva) and leader of the revolt against Roman rule in Palestine from 132-135 CE. But Bar Kokhba remains veiled in mystery – we know very little about him – although his actions (and their aftermath) helped cement the difference between mainstream Judaism and the ethnic Jews belonging to the early Christian sect. Another excellent volume is the edited volume by Peter Schäfer (Princeton) entitled The Bar Kokhba War Reconsidered (partially accessible on Google Books, and perhaps available used for a reasonable price). A specialist, but interesting, essay by Ra’anan Boustan (then from Princeton, now at UCLA) from that volume addresses the Roman legislation of circumcision in the afterwath of Bar Kokhba revolt, and is available online. From the perspective of traditional writings, Richard Marks (Washington and Lee University) book The Image of Bar Kokhba in Traditional Jewish Literature: False Messiah and National Hero (partially accessible on Google Books) is a useful reference. BAR KOKHBA (d. 135 C.E. ), leader of the revolt in Judea against Rome (132–135 C.E.). Bar Kokhba is known in talmudic sources as Ben Kozevah, Bar Kozevah, or Ben Koziva (Heb. בן כוזבה, בר כוסבא, בן כוזיבא; Sanh. 93b; BK 97b; TJ, Ta’an. 4:8, 68d), and in Christian sources as Βαρχωχεβας (Eusebius, Historia Ecclesiastica, 4:6, 2). In the recently discovered contemporary letters addressed to or originating from him, he is referred to as Simeon bar Kosevah, Bar or Ben Koseva (בר כוסבא שמעון בר כוסבה, בן כוסבא, the last form being found also in a contemporary Greek letter). The name שמעון (or its abbreviation שמע), which appears on coins of the revolt, undoubtedly refers to him. His original name was probably Bar Koseva, and it is doubtful whether it was derived from a settlement in the Judean mountains or whether it indicates his father’s name or a general family name. The appellation Bar Kokhba was apparently given to him during the revolt on the basis of the homiletical interpretation, in a reference to messianic expectations, of the verse (Num. 24:17): “There shall step forth a star [כּוכָב, kokhav] out of Jacob.” Bar Kokhba was general midrashic designation for the “king messiah” […], and customarily used before the destruction of Jerusalem . Thus, in the verse “a star out of Jacob … a scepter … out of Israel” (ibid. ), Onkelos renders “star” as malka (“king”) and “scepte” as meshiḥa (“messiah”), a midrashic interpretation current among the Zealots who joined in the war against the Romans. While this appellation became the popular one, his original name was retained in documents and letters. The disappointment that followed in the wake of the defeat (and perhaps even at the height of the revolt) may have led the people to give a derogatory turn to his original name of Bar Koseva by altering it to Bar Kozivah (בר כוזיבה) in a punning allusion to “a lie” (kazav). Even the homiletical interpretation of “a star out of Jacob” quoted by R. Akiva was from then on interpreted ambiguously, as evidenced by R. Simeon b. Yoḥai ‘s statement: “ ‘There shall step forth a star out of Jacob’ – Kozeva stepped forth out of Jacob” (TJ, loc cit.). Similarly, in talmudic sources Bar Kokhba coins are referred to specifically as those of Ben Koziva. “A coin of one who rebelled, such as Ben Koziva,” or “Koziva coins” (BK 97b; TJ, Ma’as. Sh. 1:1, 52d; Tosef., ibid., 1:6). Bar Kokhba’s personality does not emerge clearly from the scant and obscure sources available, some of which, like those in the Talmud and Midrash, have legendary overtones, while later ones, such as the sparse references by Church Father Eusebius, are tendentious. The few traits of his personality that emerge from the administrative and economic documents found in the Judean Desert do not contradict the main features of his character as incidentally portrayed in the literary sources. He may be described as a leader who, in charge of both the economy and the army, ruled imperiously, concerned himself even with minor details, and did not refrain from threatening senior officers of his army with punishment or even from inflicting deterrent punishment. The aggadah which relates how Bar Kokhba’s men were selected – by having a finger cut off or by uprooting a cedar tree (TJ, loc cit. ; Lam. R. 2:2 no. 4) – reflects the exclusiveness of an elite rebel army and the harshness and even cruelty of its leader. The controversies between him and the sages, and his reliance on his own powers rather than on help from Heaven, are depicted in the aggadah as self-aggrandizement against God: “When he went forth to battle, he said ‘Neither assist nor discourage us.’ ” To decide precisely the historical kernel that has been preserved in this tradition is difficult, but Bar Kokhba’s letters to his subordinates (such as to Jeshua b. Galgolah or Jonathan and Masbelah) confirm that he was a stern leader who vigorously insisted on his views and with a firm hand controlled not only the population but also his senior officers. In contrast to the situation during the Jewish War (66–70/73 C.E. ), the nation was now united under the leadership of a single commander-in-chief. This is evident from documents indicating that even in the final stages of the revolt he still exercised unlimited authority over his men. Presumably the unity of the nation in this war derived not only from the nasi’s powerful personality, but also from the memory of past sufferings and the yearning for liberation. Geography, too, may have been a factor in this unity, for while the revolt spread to Galilee and Transjordan, it was mainly although not exclusively centered in Judea, making it both possible and practicable to exercise effective control. Such was the background to the acceptance of a strong leader’s authority, unopposed apparently by the soldiers. This unanimity of the nation can be inferred from Eusebius (as from the Book of Revelation) where Bar Kokhba is described as a murderer and bandit who deceived the people. Even in later generations, despite the disappointment engendered by his defeat, his image persisted as the embodiment of messianic hopes. This is evident from Maimonides who, in referring to the “king messiah,” states: “Rabbi Akiva, the greatest of the sages of the Mishnah, was a supporter of King Ben Koziva, saying of him that he was the king messiah. He and all the contemporary sages regarded him as the king messiah, until he was killed for sins which he had committed” (Maim. Yad, Melakhim, 11:3). Only sparse and fragmentary information exists, some of it late, on the Bar Kokhba revolt, its origins, course, and outcome. The main source consists of the scant statements of the Roman historian Dio Cassius in the 69th part of his history of Rome, written between 194 and 216 C.E. As for Bar Kokhba’s documents, they contain nothing specific about the war itself or about its political and military significance, being mainly economic and administrative records. The revolt most probably broke out in 132 C.E. Dio Cassius states that before it began Hadrian had established a new city in Jerusalem, called Aelia Capitolina (after his own name Aelius and in honor of Jupiter Capitolinus). He built a temple to Jupiter in the new city, thereby infuriating the Jews and provoking “a fierce and protracted war.” On the other hand, Eusebius declares that Aelia Capitolina was established after the revolt. Hadrian probably began to build Aelia Capitolina before the revolt, and its non-Jewish character inflamed the Jews against Rome, but the work was not completed until after the war (see […] “New Archaeological Finds” below, for a contrary view). During 129–132 C.E. Hadrian stayed in Ereẓ Israel and its neighborhood, and his departure for Greece in the summer of 132 was the signal for the outbreak of the revolt. There were other factors that aggravated the situation, e.g., the harsh rule of Tinneius Rufus , the new Roman governor of Judea; and the disillusionment of the Jews who had hoped that Hadrian would restore the ruins of Jerusalem, when rumors that he was rebuilding the Temple fostered messianic expectations. Their hopes, speedily shattered, were replaced by profound resentment. Agitation against Rome had, it seems, existed in Judea many years before the outbreak of the revolt, and the sages may have tried to mitigate it, as may be inferred from the account of the assembly in the valley of Rimmon at which Joshua b. Hananiah calmed the turbulent mood of the people (Gen. R. 64:10). Ultimately, however, the revolt was a continuation of the uprisings of the Jews of the Diaspora against Rome in 115–117 C.E., which included “the war of Quietus” ending in 117. Even if Hadrian intended no particular enmity against the Jews and behaved in Judea with the same degree of cultural universalism that he adopted in other places, his innovations, bearing as they did a Hellenistic-Roman stamp, provoked the vehement opposition of the Jews both against non-Jewish culture and more especially against emperor-worship. Map 1. Extent of the Bar Kokhba revolt in its first year, 132 C.E. After Y. Aharoni, Carta’s Atlas of the Bible, Heb. ed., 1966. Dio Cassius gives a brief account of the course of the revolt. Accumulating arms by deceiving the Roman authorities, the Jews awaited a suitable opportunity, and when Hadrian left they openly rebelled. At first the Jews did not fight pitched battles. Instead they seized towns which they fortified with walls and subterranean passages. In an increasing number of clashes the rebels inflicted losses on the Romans. Hadrian was compelled to hurriedly send for one of his ablest generals, Julius Severus , who specially came from Britain to Judea. Due to the large number of the rebels and their desperate fury, Severus refrained from waging open war and preferred to surround their fortresses and hem them in to prevent food from reaching them. Gradually he succeeded in wearing down the Judean fighters, on whom he inflicted heavy blows without respite until he reduced them to a state of complete submission. Dio Cassius relates that the Romans demolished 50 fortresses, destroyed 985 villages, and killed 580,000 people in addition to those who died of hunger, disease, and fire. He adds that many Romans perished as well, and when Hadrian informed the Senate of his victory he did not begin with the usual formula: “I and my army are well.” Dio Cassius states that the insurrection, which was prepared in detail, spread until “the whole of Judea was in revolt” (he referred apparently to most of Ereẓ Israel, including Galilee and Golan). He further states that the Jews “throughout the world” supported the uprising as did non-Jews, too, and it was “as though the whole world raged.” In its scope and vehemence, the revolt assumed the dimensions of a war which constituted a threat to the empire. As usual with Roman historians, Dio Cassius cites a supernatural omen, to show that the destruction of Judea was predestined, when he states that the “sanctified” tomb of Solomon had fallen down of itself. Greek and Roman inscriptions mention the participation in the war of detachments of legions brought from all parts of the empire, from Egypt and as far away as Britain – the Tenth “Fretensis,” the Third “Cyrenaica,” the Fourth “Scythica,” the Second “Trajana,” the Twenty-Second “Diotrajana” legions, and perhaps also the Sixth “Ferrata” legion. The Syrian navy also presumably took part in the war. Although exact figures cannot be computed since these were auxiliary troops and detachments of legions, the magnitude of the Roman army indicates the dimensions of the war. Isolated evidence – an inscription on a tomb, third-century talmudic references to the destruction of Galilee (BK 80a; TJ, Pe’ah 7:1, 20a), the remarks of Sulpicius Severus (fourth century C.E.) on the rebellion of the Jews in Syria and Palestine in the days of Hadrian – shows the revolt spread to the north of Ereẓ Israel, to Beth-Shean and Galilee. 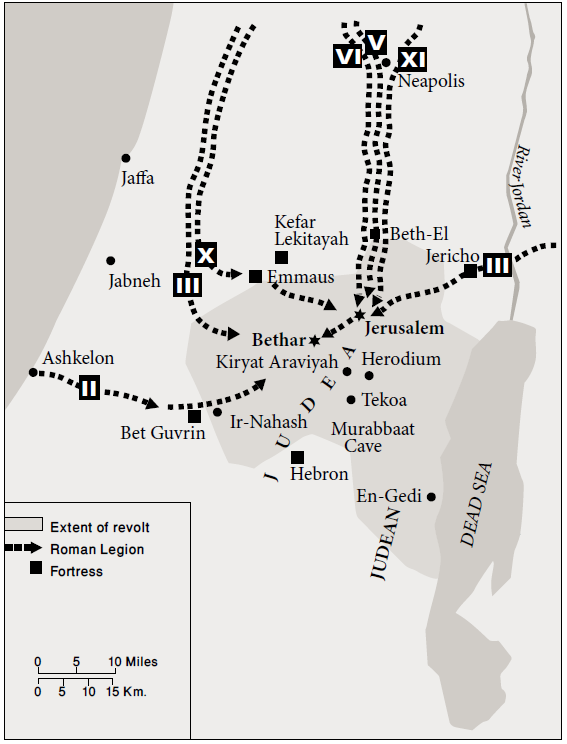 However, the main conflict took place in Judea, the Shephelah, the mountains, and finally in the Judean Desert. The war apparently lasted about three and a half years, during which Jerusalem was taken by the rebels, as evident both from the inscription לחרות ירושלים on coins of the revolt and perhaps also from the Judean Desert documents. Appian, a contemporary of the revolt, Eusebius, in his De Theophania, and Jerome (fifth century C.E. ), in his commentary on Jeremiah 31:15, all state that Jerusalem was destroyed in the days of Hadrian. It would therefore appear that Bar Kokhba captured the city and only after his military defeat did Hadrian regain control and destroy it. There may be an allusion to this in Midrashim which tell of Hadrian’s entry into Jerusalem and his desecration of the Temple Mount (Tanḥ. B., Ex. 128; Ex. R. 5:5, Deut. R. 3:13). Some maintain that the design on coins of the revolt, depicting a four-columned building surmounted by a star, symbolizes the Temple, and if the undated coins bearing the inscription לחרות ירושלים or simply ירושלים are indeed to be assigned to the third year of the revolt, Jerusalem was still in Bar Kokhba’s hands toward the end of the revolt in the third year of the war, that is, in Tishri 134 C.E. This is confirmed by one of the Judean Desert documents which is dated שנ)ת תלת לחרות יר(ו)שלים) (“the third year of the freedom of Jerusalem”). This scant evidence shows that during the Bar Kokhba revolt Jerusalem not only symbolized the yearning for freedom but also served the political expression of the consolidation of the revolt and of its sway in Judea. There is, however, no evidence that the Temple was rebuilt at that time, nor is there any proof that Bar Kokhba was about to rebuild the Temple. However, an altar may have been erected for sacred worship. Bar Kokhba made a final stand at Bethar in the Judean Hills, but from the finds in the Judean Desert it would appear that after the fall of the last stronghold the flame of revolt continued to flicker in the desert and in the vicinity of the Dead Sea. Nevertheless, in talmudic and midrashic sources Bethar represents the fortress in which the rebels found refuge, and its fall, along with the defeat of Bar Kokhba who met his death there, symbolizes the end of the revolt. The place was apparently chosen as the rebels’ main stronghold because of its strategic situation on the edge of a mountain overlooking the Valley of Sorek and dominating the important Jerusalem-Bet Guvrin road, and possibly also because of its fertile soil. Since it was not adequately fortified, Jerusalem could not serve as a stronghold. At that time Bethar was considered a large city (kerakh; TJ, Ta’an 4:8, 69a; Lam. R. 2:2 no. 4; cf. Mid. Hag. to Deut. 28:52), perhaps because numerous inhabitants from the entire neighborhood had gathered there, as attested by Jerome (in his commentary on Zech. 8:19), who mentions that many thousands of Jews found refuge in it – Bether ad quam multa milia confugerant Judaeorum (and cf. the midrashic references to 400 synagogues in Bethar). 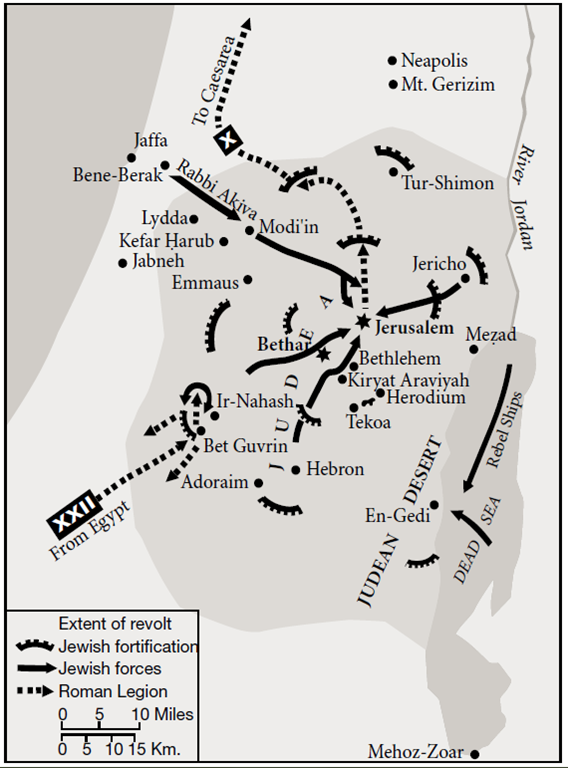 The actual siege of Bethar began apparently after the recapture of Jerusalem. Whether Bar Kokhba’s men had intended it from the outset to be their principal fortress or were driven there by the force of circumstances cannot be known. Even during the siege those in Bethar maintained contact with camps of fighters in the Judean Desert. One of the documents states: “Near the well of Ben Koseva, Nasi of Israel, in the camp,” referring probably to the camp of Bethar, which is not mentioned, however, in the Dead Sea documents. Severus’ strategy was to intensify the siege on the fortress, and a siege wall (circumvallatio) was built for this purpose. It was attacked by the besieged in desperate sallies, while the blockade grew tighter. A clear reminder of the Roman armies’ presence in Bethar itself was preserved in a Latin inscription which was engraved on a rock near the well of Bethar and mentions detachments of the Fifth “Macedonica” and the Eleventh “Claudia” legions. The inscription is now illegible. Eusebius states that Bethar was besieged in the 18th year of Hadrian’s reign, that is, in 134 C.E., about two years after the outbreak of the revolt, and that its fall was caused by hunger and thirst. According to the talmudic account (TJ, Ta’an 4:8, 68d; Lam. R. 2:2, no. 4), Hadrian unsuccessfully laid siege to Bethar for three and a half years, until a Samaritan pretended that Eleazar of Modi’in (ha-Moda’i) had conspired with him to surrender the city to the Romans. Incensed at this, Bar Kokhba killed Eleazar. “Immediately Bethar was captured and Ben Koziva met his death.” Presumably great importance was attached in besieged Bethar to sages such as Eleazar of Modi’in, one of the leading rabbis of his generation, but whether he is identical with the Eleazar whose name appears on coins of the revolt cannot be determined. (In one of his letters, Bar Kokhba mentions a רבנו בטניה בר מיסה, whom he regarded as a great man.) These circumstances suggest that eventually a dispute broke out between the sages and the commander-in-chief and spread among the besieged. In any event these reports, like the statement of Eusebius, indicate that the capture of Bethar was difficult and was achieved under unusual circumstances. The death of Bar Kokhba is enveloped in a legendary halo. The accounts of the massacre perpetrated in Bethar attest to the ferocity of the struggle (Git. 56a–b; Song. R. 2:17; cf. ARN 138, 115: “Not a soul escaped”). The sages state that on Av 15th the burial of the slain was permitted (Ta’an. 31a). Tradition has it that Bethar was taken on the Ninth of Av (ibid., 29a), and Jerome (loc. cit.) also says that it occurred in August: in hoc mense (scil. Augusto). On the basis of the latest date – the fourth year of the liberation of Israel – mentioned in one of the documents, Bar Kokhba’s rule lasted more than three years. In Jewish tradition the fall of Bethar was a disaster equal to the destruction of the First and Second Temples. The Jewish population of Judea was largely exterminated in the period of repression which followed the fall of Bethar. The subjugation was associated with massacres and religious persecution, the sale of Jews into slavery, and uprooting of the people from the soil. The Jewish center of gravity now moved northward, chiefly to Galilee. Thus ended the final and perhaps greatest war of liberation of the Jews in ancient times. The independence of Judea had come to an end. The finds, dating from the days of Bar Kokhba and brought to light in the Judean Desert in 1952–61, contain additional facts of great importance for an understanding of the social and economic conditions prevailing during the Bar Kokhba war in 132–135 C.E. The first documents were found in 1952 in Wadi Muraba’at about 11 mi. (18 km.) southwest of Qumran . Among them are commercial contracts, letters of divorce, two letters from Bar Kokhba, and one from the administrators of the community addressed to Jeshua b. Galgolah. An archaeological expedition undertaken in the Judean Desert south of En-Gedi in 1960–61 uncovered, alongside material finds such as skeletons, linen, remnants of clothes, metal and glass vessels, and remains of food, many documents of the time of the Bar Kokhba war, chiefly in one of the caves in Naḥal Ḥever, now named “The Cave of the Letters.” The letters and economic documents in Hebrew, Aramaic, and Greek uncovered in the cave testify to the economic position in southern Judea on the eve of the revolt and at the height of the war[…]. In an Aramaic letter to Judah b. Manasseh of Kiryat Araviyah, Bar Kokhba orders Judah to supply him with the Four Species for Tabernacles and apparently reminds him about separating the tithe: ותקן יתהן (“and give the dues from them”). Such references, made incidentally or hinted at in the letters, may indicate that Bar Kokhba’s men, even under danger, strictly and quite naturally kept the commandments of Judaism, such as the sanctity of the Sabbath, the laws of the priestly and levitical dues, and the fullest observance of festivals. The letters and other documents uncovered in the Judean Desert contain nothing specific about the attitude of the sages toward the rule of Bar Kokhba nor is there any mention in them of Bethar and of the war there. Nevertheless it is possible to comprehend from them explicitly and at first hand about Bar Kokhba’s aggressive personality and his status, the economic straits in which the fighters of Judea found themselves, and the geographic extent of the revolt. The nasi was concerned about supply problems, food for his camp, and matters pertaining to real estate. The economic documents found in Wadi Muraba’at show that leases were made in the name and with the sanction of Bar Kokhba: “On the instructions of Simeon b. Koseva.” Apparently the land belonged nominally to the nasi, it being clearly stated in a lease, “You have leased the ground from Simeon, the Nasi of Israel.” In his name the lessors laid down the quota of grain that was to be given to them. As was to be expected in a time of war, the authorities insisted on the cultivation of the fields and confiscated the lands of those who neglected to till them. They “were dispossessed of the land and lost everything.” In effect, Bar Kokhba regarded himself as holding the authority of the Roman emperor and transferred the lands of liberated Judea to his own possession. His orders concerning leases, sales, and confiscations were grounded on a juridical succession to the Roman rule, by virtue of which he was empowered to exercise control over the lands of Judea and confiscate property for the public good. Contracts found in Naḥal Ḥever indicate that Bar Kokhba wished to prevent the concentration of the lands of En-Gedi in the hands of a few owners in order to increase the supply of food in a time of stress. From the names of the settlements mentioned in these documents, Bar Kokhba’s men apparently controlled extensive areas, in the frontier regions of the Judean mountains, in the neighborhood of Bet Guvrin (Ir-Nahash), and in the Judean Desert, and maintained contact, it seems, with regions east and south of the Dead Sea, such as Ma’aleh ha-Luḥit in the district of Eglatin in Moab and Zoar in the Aravah. Herodium, the town of Herod about 6 mi. (10 km.) southeast of Jerusalem and mentioned in the documents, became an economic center in which the nasi’s representatives were stationed; En-Gedi was an important supply harbor for the rebels. The settlements of Tekoa and Kiryat Araviyah in the vicinity of Bethlehem are mentioned in the documents. According to the reconstruction of ב …שלים as Jerusalem, proposed by J.T. Milik who made a study of the Wadi Muraba’at documents, that city is referred to in two of them, one dating from the second, and the other from the fourth year “of the liberation of Israel” (Elul, 133 and Tishrei, 134, respectively). After the defeat, the fugitives from the war in Judea gathered in the Judean Desert, which then became the rebel center. The remains of Roman military camps found above the caves in Naḥal Ḥever show that the legions besieged the remnants of the fighters who, together with their families, had taken refuge in these hiding places. Surrounded by the Romans, there they met their death. Since the writing of the above in the late 1960s new archaeological information concerning the Bar Kokhba revolt has emerged as a result of the intensive investigation of hundreds of refuge caves and underground hiding complexes. Refuge caves are found mainly in the Judean Desert and in the cliffs overlooking the Dead Sea, and were used as shelters for Jewish refugees at the close of the Bar Kokhba revolt. Underground hiding complexes, however, were subterranean warrens hewn artificially under or near residential buildings within Jewish towns and villages (some 125 sites according to a recent count). They have been found in the Judean Shephela, and in the Beth-El and Hebron Mountains, and reflect the general boundaries of the area that was under Bar Kokhba’s administration. Excavations at the Abi’or Cave in the Judean Desert in 1986 and later in 1993 brought to light numerous fragments of new documents written on papyri in Greek and Aramaic. Additional finds from the cave consisted of textiles, ropes, and parts of sandals. These items were brought to the cave and hidden there towards the end of the revolt. Excavations conducted in 1984 by Tel Aviv University confirmed that Khirbet al-Yahud (10 acres in size) is indeed Bethar , the last bastion of Bar Kokhba. Hastily erected fortifications were uncovered and the discovery of slingstones and arrowheads indicates that a battle took place there. Roman siege camps were also identified in the vicinity of Bethar (present-day Battir). Various artifacts dating from the time of the revolt have been unearthed at a number of sites and within underground hiding complexes, notably various forms of pottery, stone vessels, and coins. An important discovery was that of a lead weight found at Horvat ‘Alim in the Shephela, bearing the name and title of Bar Kokhba, which was evidently used for administrative purposes. A signet ring bearing the name of Bar Kokhba is also reported from the vicinity of Quneitra in the Golan, and perhaps was brought to this destination by Jews fleeing persecution at the end of the Bar Kokhba revolt. A number of coin hoards have become known, many of them through clandestine digging, containing Jewish coins mixed with those produced in Aelia Capitolina. Clearly, Aelia Capitolina was founded before the outbreak of the revolt. There is no evidence that Bar Kokhba at any time held Jerusalem (see above for contrary view). Coins dating from the Bar Kokhba revolt have also begun emerging from controlled excavations, especially within the refuge caves and underground hiding complexes. Thanks for this excellent post–I learned so much! 10/05/2009 01:14 – לכבוד ל"ג בעומר: מרד בר כוכבא – והאם יש להמשיך לחנך על ערכי הגבורה כיום? « המקום הכי טוב: אמצע הדרך! לכבוד לג בעומר: מרד בר כוכבא – והאם יש להמשיך לחנך על ערכי הגבורה כיום? « המקום הכי טוב: אמצע הדרך! לכבוד לג בעומר: מרד בר כוכבא – והאם יש להמשיך לחנך על ערכי הגבורה כיום? | המקום הכי טוב: אמצע הדרך!